Voice search is a revolutionary technology that’s changing the way people use the internet. Who wants to type when they can just speak into the phone and conduct a search? In fact, 72% of voice-activated speaker owners use their devices as part of their daily routine. 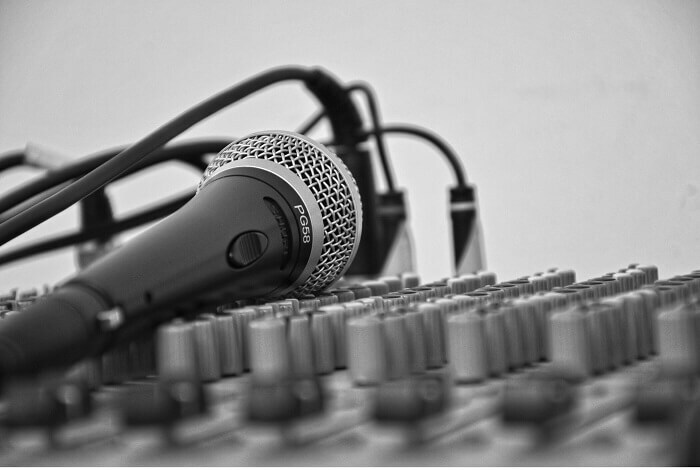 The popularity of voice search is increasing tremendously. And to cater to the rising need of smartphone users, you now have voice search programs like Google Assistant, Siri, and Cortana. These programs are updated and upgraded regularly. When you optimize your site for voice search, it increases the possibilities of your content appearing in the direct answer or rich answer box. This can help you gain new customers as you’ll be catering to an even bigger audience. This is particularly appealing for small businesses that want to expand their business. Once you create your website, you can use conversational phrases to optimize your website content for voice search. Observe how people ask questions and talk in real life and include more natural conversations in your content. That’s just one way of optimizing your website for voice search, and there are more. The following are four cost-effective and easy ways for small businesses to optimize their sites for voice search. Often, people use voice search for local queries like “restaurants near me” or “gym near me.” You need to make sure that your small business is featured in search results like this. That’s why you should create a Google My Business page. A GMB page will help your small business improve your rankings in voice search and show your page in the top results. You can follow these tips to create an effective GMB page for your small business. In your GMB page, ensure that you add important details like your business name, phone number, and physical address. When you enter such detailed information, the chances of your business popping up in Google search queries will increase. In addition to these details, you also need to write a great introduction to your business. Describe your products or services in short and simple sentences that are easy to understand. Above all, make sure you select the most relevant categories under which your business fits. When you select the right categories for your small business, it improves your chances of showing up in the most relevant voice search queries. It thus helps improve your voice search rankings. Another effective way to optimize your site for voice search is to use long-tail keywords. This tactic is not only useful for large businesses but it’s equally important for small businesses as well. Get rid of short 1-2 keyword search queries and use long-tail conversational keywords instead. This will significantly increase the visibility of your small business as long-tail keywords tend to be less competitive. You need to imitate the way people talk and ask questions. Collect and compile questions that your customers are asking you about your business. Then create content pages which focus on more conversational and long-tail search keywords. This will help you increase the rankings of your website in search engine and voice search results. You can use tools like Pro Rank Tracker to analyze all the keywords for which your website is currently ranking. This will help you understand how your long-tail conversational keywords are performing. Plus, you might even come across keywords for which you’re already ranking but aren’t yet using to optimize your content. This might not be a cost-effective way for small businesses to optimize their website for voice search. However, consider this a one-time investment which will have a long-term impact on your website’s ranking and visibility. It will also help you to stay one step ahead of your competitors. That’s mainly because smartphones are the most preferred device for people using voice search. 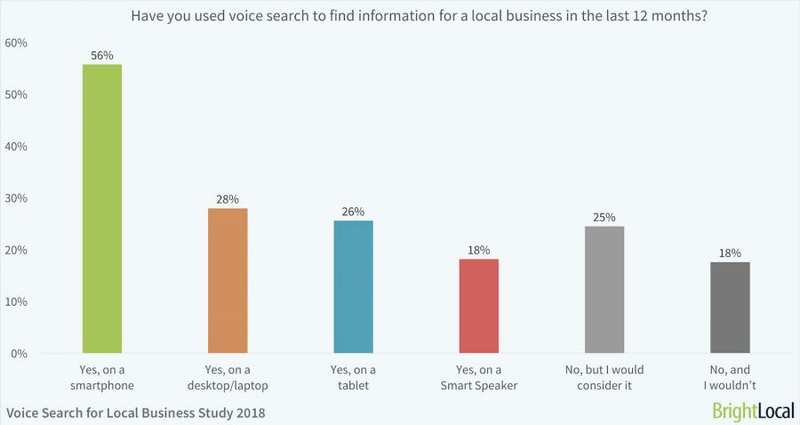 In fact, 56% of people have tried using smartphones to conduct voice search for a local business. Therefore, you should make sure that your website can cater to these smartphone users. This means you need to optimize the design of your website and increase its load speed. The reading pattern on a desktop and on a smartphone are completely different. People follow an F-shaped reading pattern when they use a desktop. Whereas a smartphone creates a marking pattern. This means they keep their eyes focused on one place while they scroll or swipe the page with their fingers. In simpler terms, smartphone users scan the content quickly and just read the heading and subheadings. So, you need to include short sentences, appealing headings, simple words, and more white space to your web pages. This will make your web pages easier to skim through for the smartphone user. To test the scanning and skimming ability of your website, you can use tools like Google’s Mobile-Friendly Test Tool. The tool will help you evaluate your website and will give you a detailed report highlighting issues that you need to improve. In addition to this, you also need to improve the page loading speed of your website. Otherwise, the idea of creating a responsive website will fail tremendously. 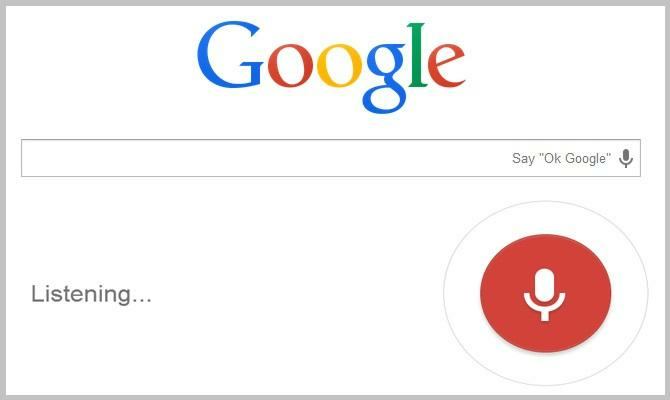 Did you know that it takes 4.6 seconds to load an average voice search result web page? This indicates that it’s crucial for your webpage to load within seconds of appearing in voice search results so you can beat the competition. Webpages that load quickly will also help you get the undivided attention of your audience. 53% of voice-activated speaker owners report that they experience a natural feeling when talking to it. In fact, 58% of owners use their voice-activated speaker to manage their weekly shopping list. These statistics prove that voice assistants like Google Assistant, Cortana, and Alexa are here to stay. More and more people will use it in the coming months. So, it is very important for small businesses to create content-based actions, as it will make their content more accessible for voice assistants. You can custom build skills in Alexa or create actions on the Google App. These actions are nothing but software that increases the capabilities of voice assistants like Alexa to interact with your content. They enable users to have a helpful and relevant conversation with your content. Having said that, make sure you don’t create actions just for the sake of it. Ensure that the actions are beneficial and optimized according to the requirements of voice home assistant users. To create content-based actions, make sure to select content which already uses Accelerated Mobile Pages (AMP) and structured data markup. This will help you to claim your actions through the Assistant directory. The popularity of voice search and the usage of voice search devices is increasing rapidly. It is dramatically changing the way customers approach and behave with your business. Small business owners especially should leverage the power of voice search to get ahead of the competition. Make sure your website is mobile responsive to cater to smartphone users who conduct voice searches. You also need to use more conversational keywords because that’s what people use most when they conduct a voice search. What strategies have you used to optimize your site for voice search? Please feel free to share your experiences with us in the comments.